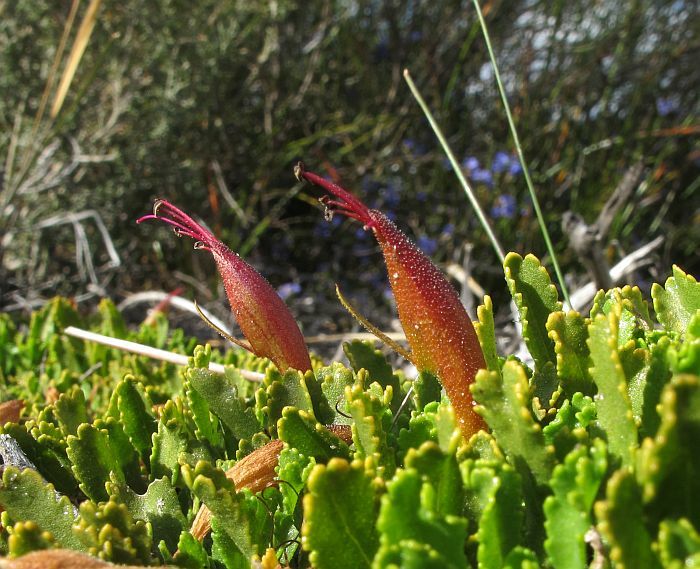 The Eremophila genus from the Scrophulariaceae (Myoporaceae) family, contains well over 200 species (most in WA) with many more being regularly discovered. This is because they are a ‘desert loving species’ therefore mostly found in the hot/arid, sparsely populated and poorly collected inland portion of Australia. They come in all shapes and sizes with flowers in just about every color. However, prostrate species are most unusual within this diversity of form, with only three fully prostrate plants, plus a handful other species that have prostrate forms, but they do not produce roots from the horizontal branches, as do the three fully prostrate ones. 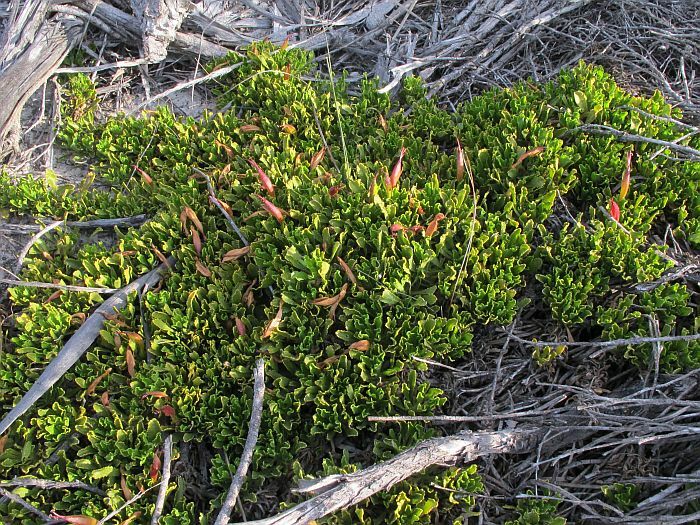 Of the three prostrate species, E. debilis occurs in NSW and Qld, whilst the other two (E. serpens and E. biserrata) are endemic to Western Australia and both are found in my Esperance survey region, although this species (E. biserrata) only just. 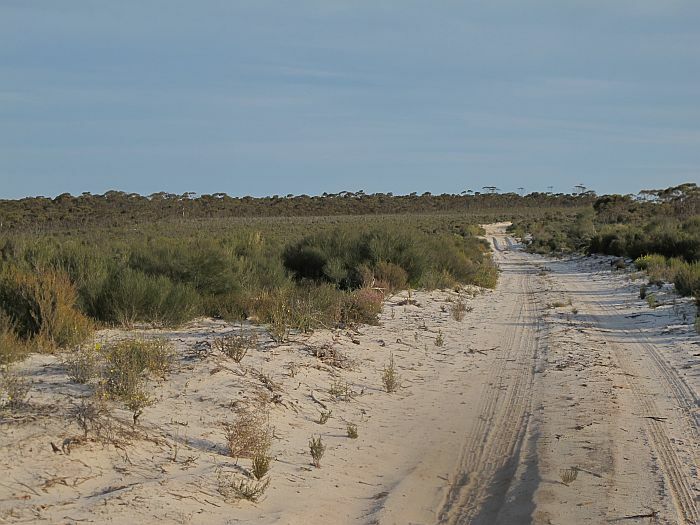 It mainly occurs further west in the Hyden/Forrestania/Lake King region, with the above being the most easterly known colony 115 km (70 miles) NW of Esperance, growing in sandy soil over clay 50-100 metres from a dry saline river bed. The above habitat photograph was taken with my back to the river, with the Eremophila plants occurring on both sides of the track. 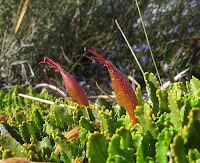 Eremophila biserrata has a Priority Four Conservation Code rating, which means the plant is considered rare, but not currently endangered. 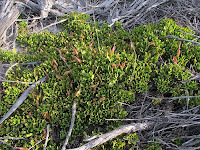 The above colony had around 20 or so plants, measuring to 60 cm (2’) in diameter, although further west and probably in a less dry habitat, it has been recorded growing to 3 metres across. 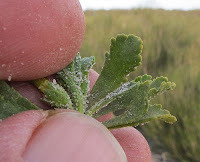 The green upright toothed leaves, are tightly packed and can vary in shape and size between colonies. 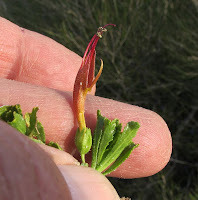 The dull red/yellow/green flowers are also upright and protrude above the leaves, they are noticeably smaller than Eremophila serpens, being around 2 cm (3/4”) in corolla length, whilst E. serpens is over 2.5 cm (1”) in corolla length. However, there is unlikely to be any confusion between the two as their foliage is vastly different. 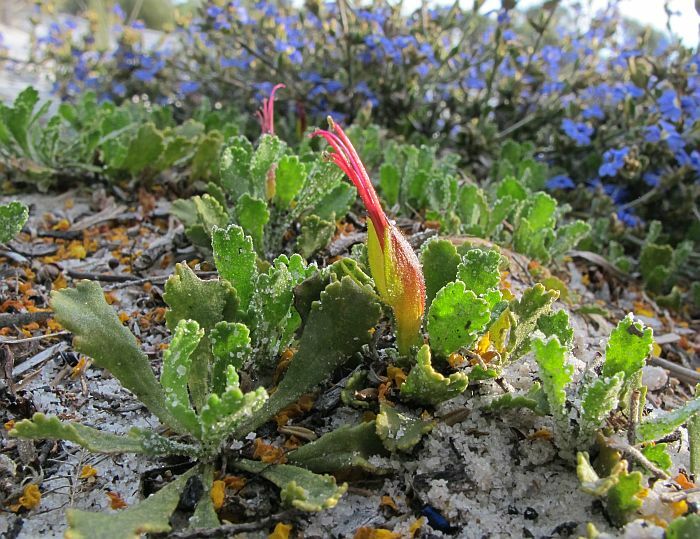 Depending on local rainfall, flowering can occur anytime from autumn to early summer, although September/October would be the most reliable period. The flowers are pollinated by honeyeating birds that hop over the thick green leafy mats to do so.